I’m very excited to have my first play produced in New York. It’s a brand new short play entitled “Safe Spaces” and it will be performed at the Gallery Players Theater as part of their annual Black Box New Play Festival. I’ll write up more about the play later, but wanted get their poster out. Yes, my name’s on it! My New Play! Scripts are here. So excited to get these in the mail the other day. It’s my first full-length play in about four years. I’ll be producing it this semester for a May 2016 show date. Auditions are January 18. It’s going to be an absolute blast! In Malaysia on BOOKURVE HERE! 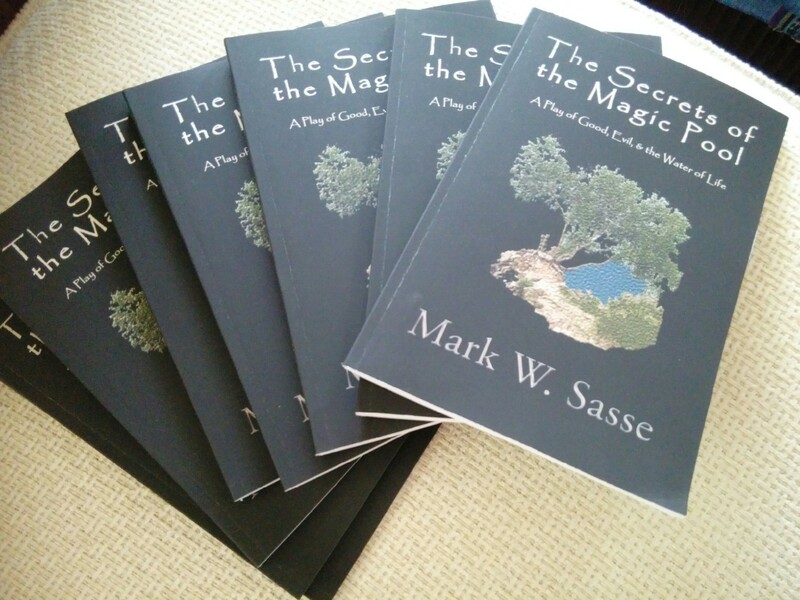 Now Available: “The Secrets of the Magic Pool” – My first full-length play in four years. If you know any directors, drama teachers, or theatre lovers, please share this with them! A witch who covets the pool. A crazed woman who controls it. A princess who wants to marry her prince. A cobbler who wants to marry off his daughters. A baker who keeps a deep secret. A blind beggar who sees better than most. Set off on a magical journey to discover the secrets of the magic pool. A witch tempts the king’s exiled brother, Cane, with a drop of the magic water in order to use him to break the curse of the caretaker of the pool. Cane’s plot to capture the water puts him at odds with the prince of the Northern Kingdom, the princess he intends to marry, and the unlikely residents of the village of Kidron. But when the witch comes calling, there’s more than just Cane to worry about. 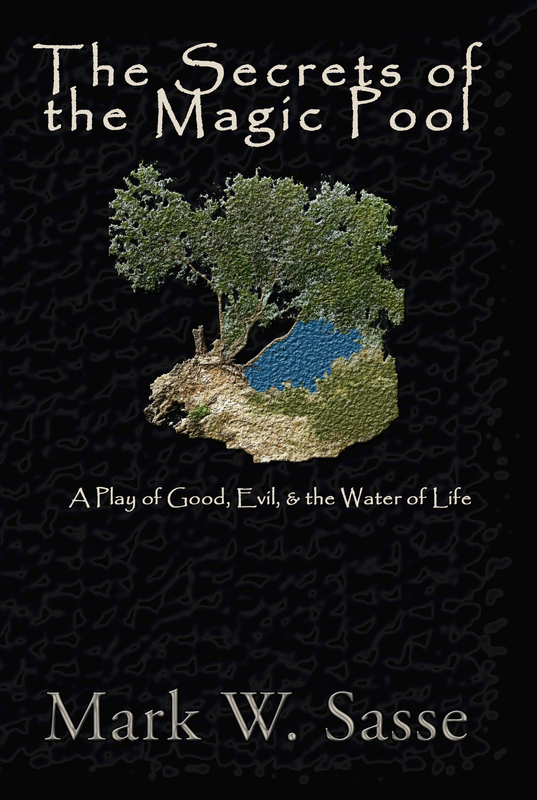 With a wonderful cast of thirteen unforgettable characters, “The Secrets of the Magic Pool” will delight audiences of all ages with its witty dialogue, intense dramatic scenes, and emotional impact while exploring universal themes of family, courage, temptation, love, and sacrifice. It’s rare to be in a situation where one receives detailed and completely unbiased feedback of one’s writing. Sure, unknown reviewers leave ratings and reviews for my novels, but not many leave a score and give an assessment of the overall thoughts of an author’s writing. I received that recently and found it very interesting and encouraging. I submitted a play entitled “A Writer’s Satire” to the Pittsburgh New Works Festival. 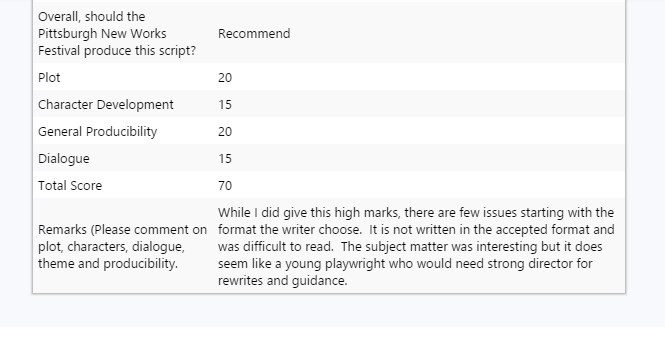 And while it was not one of the plays chosen for production (out of the 250 submitted), I did receive interesting feedback from two anonymous judges who evaluated my script. A couple points I find interesting on this one. This person liked the plot better than the other judge, but gave me slightly lower marks on both character development and dialogue. The judge was also annoyed with the format that I chose for that piece. 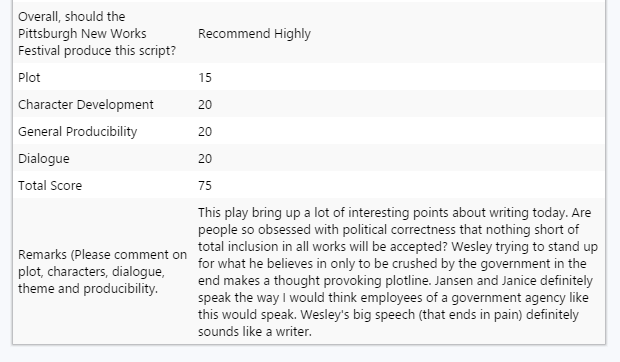 I admit, I didn’t use standard American format for that play simply because I find it more time consuming to write in that format and I must have been too lazy to switch it over when I sent it in. I wonder if that would have affected the scores? It certainly seems like it might have. My bad! I also find it interesting that this judge calls me a “young playwright.” Fascinating, and not completely untrue. While I’m not as young as I once was and no-one will ever confuse me for a youngster, I am still a rather young playwright. I wrote my first play about seven years ago. I became serious about my writing about four years ago. I’m still learning. I have more than a half-dozen full-length plays under my belt and more than 50 short plays finished. So while I have a lot of experience, I am young in playwright years. I don’t mind that comment. Overall, I was thrilled with what the judges thought about this piece. It’s a piece I really like, and it will be produced in Kuala Lumpur as part of the Short & Sweet Festival Malaysia in October. I look forward to see what they will do with it. It’s always an encouragement to be validated in one’s craft by anonymous industry insiders. Now I just have to keep writing. I wonder what will come out next.